Currently, large Jupiter-class planets in close "torch" orbits around their host stars -- "hot Jupiters" -- are easiest to detect. In general, given the constraints of today's technology and analytic methods, astronomers are not able to confirm the detection of nearby extrasolar planets with masses significantly less than half of Jupiter (e.g., Earth-class terrestrial planets) around sun-like ("Sol-type") stars. Currently, about three to four percent of over 100 Sol-type stars that are relatively close by have been found to have such large planets. The table below lists confirmed substellar companions in orbit around "normal" stars by increasing mass (in Jupiter-mass equivalents), followed by a list of unconfirmed objects in order of increasing distance from Earth in light-years (not displayed). 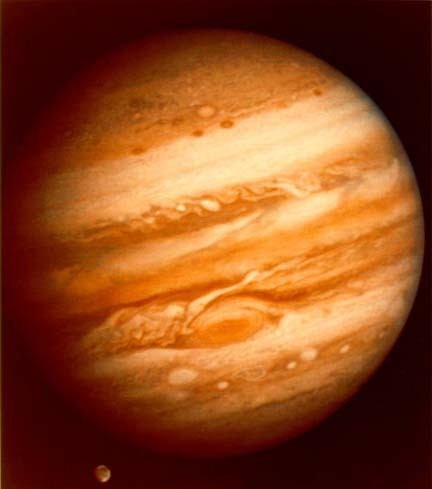 *Photo of Jupiter and Ganymede by NASA.